The balanced rocks are a geological formation created due to wind/water erosion or glacial melting. These precariously balanced rocks are wonder of the nature and to a viewer it looks that these would topple by a gentle human push or a wind force. However most of these rocks have remained steadfast for past several thousand years though some were vandalised and pushed over. To some scientists these rocks are a sign of seismic stableness of the location. This post is part of the series about these awesome and breathtaking rocks around the world. List giving links to individual rocks can be seen here and a combined big page showing all the rocks can be viewed here. 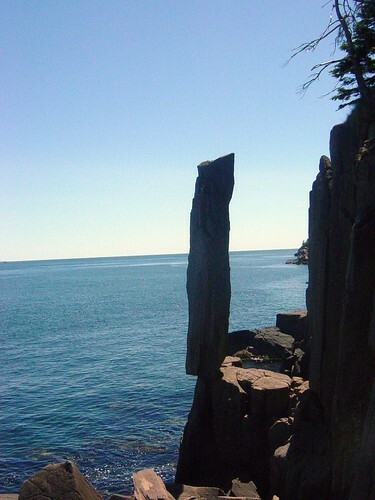 St. Mary's Bay, Long Island, St. Mary's Bay, Nova Scotia has many basalt rock formation but pictured below is the most precariously positioned, nine metres high, basalt tower which seems to defy gravity as it stands on its end at the edge of the rock below. The rock is reportedly standing for thousands of year if not a couple of millions years.